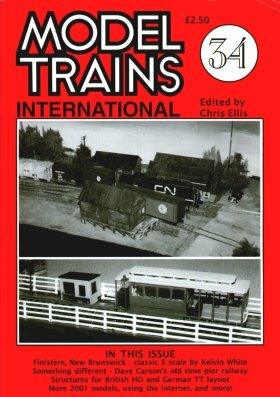 Comment on the internet and its usefulness for railway modelling. Part 2 of the annual 'New Products' review. Useful advice on how the internet can be of help to the modeller. Tips for using Jouef kits to make more typically "British" buildings. Ultra-small (4ft 6in x 1ft) and portable British HO layout. Compact (12ft long) switching layout set in Canada. German-outline layout depicting a mainline Station in 7ft x 1ft. US-outline switching layout in 5ft x 2ft. The first article about this now-familiar Pier Tramway layout. Two trackplan variations by Jack; the first is a stretched version of Tutelo (above) while the second is the now-famous (and much-copied) "Box Street Yard".